Figuera, O. & Nieto, A. (2018). 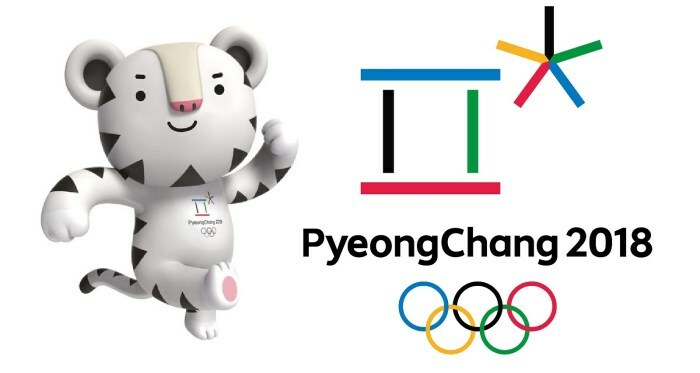 The Pyeongchang 2018 Winter Games on Twitter and Facebook. Social Media and Global Sport Observatory, Centre d’Estudis Olímpics, Universitat Autònoma de Barcelona. The 2018 Winter Olympics, officially known as the XXIII Olympic Winter Games and commonly known as Pyeongchang 2018 ran from 9 to 25 February 2018. The Games featured 102 events in fifteen sports and a total of 2,952 athletes from 92 National Olympic Committees were slated to compete, making it the first Winter Olympics to surpass 100 medal events. With 13 worldwide Olympic partners, a broadcasting coverage of 200 countries, 5 billion people who had access to more than 500 hours of television coverage captured by 450 cameras of the Olympic Broadcasting Services (Settimi, 2018) and a record number of events and countries participating, these Games were a huge success and a tremendous opportunity for everyone to take part in the values of the Olympic movement. 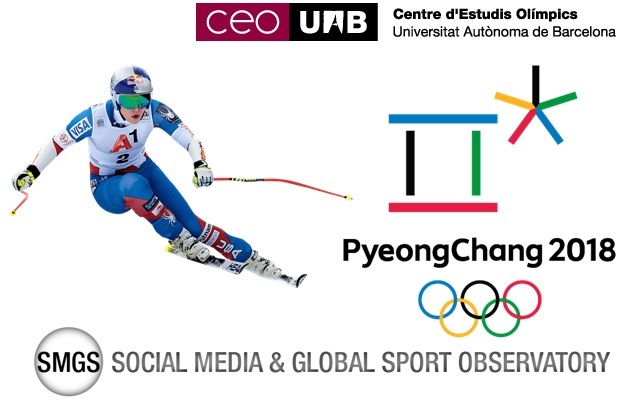 The Social Media and Global Sport Observatory, run by the Olympic Studies Centre CEO-UAB, discusses in this presentation the impact of the Pyeongchang 2018 Winter Olympic Games on Twitter and Facebook. Considering the importance of sports on society, as well as the special relationship between sports and media (Bryant & Holt, 2006), and knowing the effect media content can have on people (Coakley, 2004; Hardin, 2009), studying the impact of the networks is essential to understand the modern Olympic Games. Of the 13.340.243 tweets recovered from 3.220.682 distinct users, we can see high activity peaks especially during the closing ceremony (25th February) with more than two million tweets. 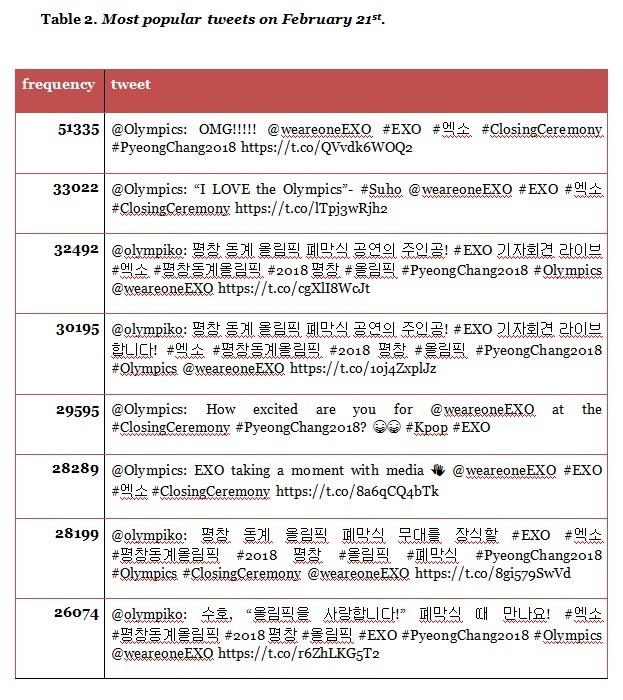 During the competition, we may note that on the 21st there was also an activity peak – unfortunately, this was not due to any sports-related event but because the K-Pop band EXO announced they were going to play during the closing ceremony as the official Olympic account on Twitter credited (Table 2). As we can see, the K-pop phenomenon is widely popular and ousted the sport itself from the front page. 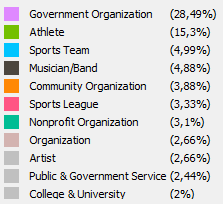 Another K-pop band, BTS, was the fifth and seventh most mentioned account during the Games. 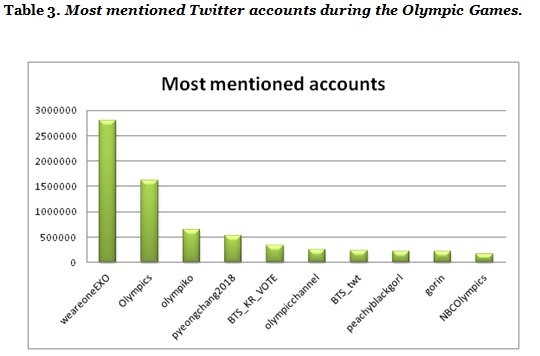 Albeit the official Olympics account was second and its Korean version the third one, well over the Pyeongchang 2018 or the Olympic channel accounts, which ranked fourth and sixth respectively (Table 3). The user peachyblackgorl was also very mentioned being controversial while tweeting about supposedly forgotten black athletes – this account has currently been suspended. Moreover, the highest number of user activity across all the Olympic Games was again during the closing ceremony when EXO band was playing. In that minute (12:59 UTC time) 2,626 tweets about any Olympics-related content were written. To find an athlete among the most mentioned accounts we have to scroll down until the 19th position where the American figure skater Adam Rippon became well known for reporting anti-gay hate comments and not receiving vice president Mike Pence. This tweet he wrote during the Olympic Games has today the impressive number of 332,000 likes, 56,000 retweets and 12,000 comments. 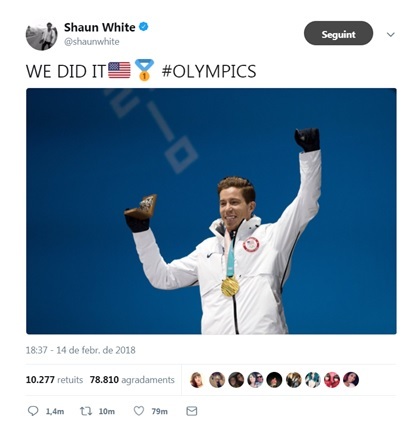 Although the most popular moment using a dataset where only the top athletes were considered was when the American snowboarder Shaun White won the gold medal on February 14th. Many Twitter users utilize other people’s content. Retweets do more than spread messages more widely—they invite a structure for conversation and comment (Boyd, Golder & Lotan, 2010; Weller et al, 2014). The day with most retweets was February 25th with 875,728 RTs about the closing ceremony (Table 4). 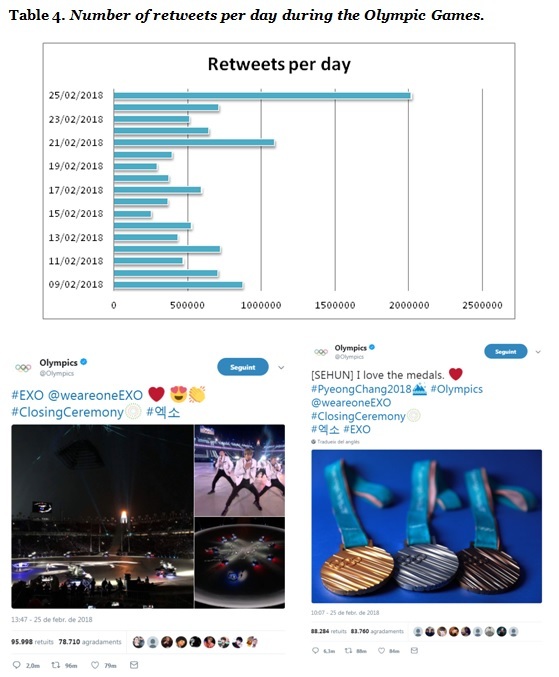 The second day with most retweets was February 21st when the official Olympic account posted some content about the band EXO that played in the closing ceremony a few days later, as we saw in table 2. And the third was February 9th when the Olympic Winter Games began where the major part of the RTs were related to the opening ceremony. Hashtags are good indicators to detect events and trending topics (Kwak et al, 2010), they are more commonly used to join public discussions than to organize content for future retrieval (Huang et al, 2010; Meij et al, 2012). 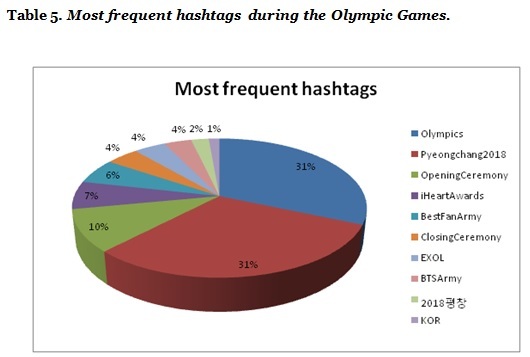 The top 3 most used hashtags -#Olympics, #Pyeonchang2018 & #OpeningCeremony- are exclusively related to the Olympic Winter Games, leaving aside athletes and partnerships. These hashtags were released by the Olympic’s official Twitter account. The rest are related to the different performances of the closing ceremony and the Korean Olympic Team, as we can see in table 5. These are the most popular publications of the Olympic official Facebook page during the Olympic Winter Games PyeongChang 2018. The first one was a post about Petra Majdic, who refused to give up after injury in Vancouver 2010 and finally, despite the pain and the suffering, she won a medal. The second one concerning to the athlete Andri Ragettli during the competition, and the third one was another motivational video about the story of the first Jamaican Bobsled Team. In the table, you can see how videos are the type of content that generate more engagement. Graph 1. Official Pyeongchang 2018 Facebook page network. 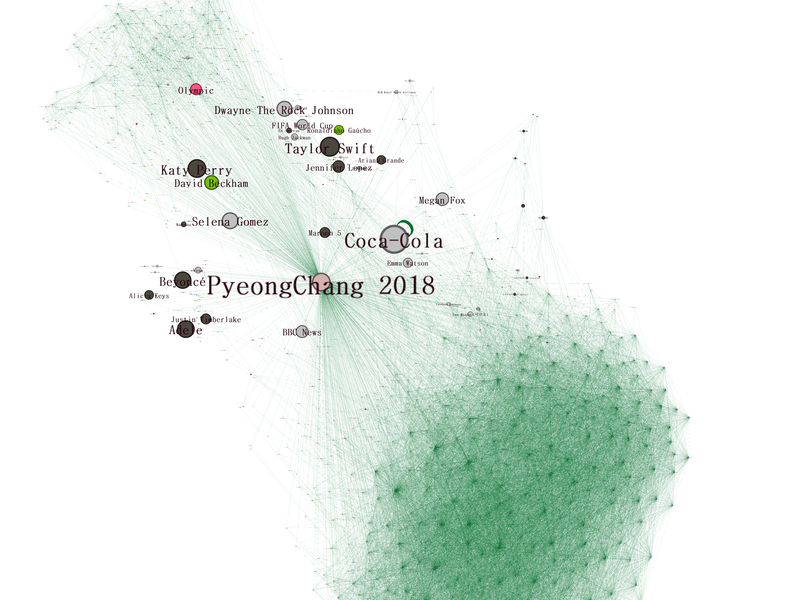 We can see the centrality degree of the Pyeongchang 2018 official fan page on Facebook, from where all other 902 nodes set off. Each node represents a page linked to the Pyeongchang Games through likes. There are 21,411 edges connecting the nodes between them, what suggests a high degree of interconnection. The bigger the node is, the more edges start on them. As the legend shows, the color depends on the category of the node, that is, for instance, government organization, athlete, sports team, etc. The huge number of interconnections makes the graph difficult to read as a whole but all actors are there: one could zoom in far enough to see the 902 of them that the official Pyeongchang profile on Facebook is connected with. As we can observe, artists, especially singers are the most popular along with Coca-Cola, although an honorable mention should be made to the official Olympic channel, which stands out among celebrities as a protagonist of this network. The most striking aspect of this report is that some of the most mentioned athletes or tweets had little to do with sporting merits or Olympic achievements. 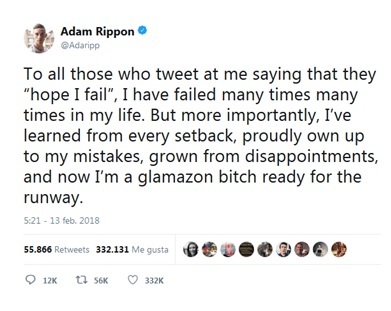 Adam Rippon became a social phenomenon for reasons that went beyond sports and so did user peachyblackgorl. In spite of this, Olympic official accounts were remarkably relevant and their presence is well credited among our statistics. Twitter continue to be an important conduit between organisations or athletes and fans, not only by the sheer numbers: more than three million unique users spend some time condensing their thoughts on 280 characters at any given time in those two weeks but also because we observed a pattern that emotional content is much more popular and has a higher spreadability than any other. Mere pieces of information are not so influential anymore and anonymous users can become trending topic as long as they know how to engage with the public. Speaking of engagement, that is the involvement of the fans and followers and the degree of interaction between organisations and users (Fernández Peña et al., 2014; Nuñez, 2017), its rate across publications was worthy of consideration. 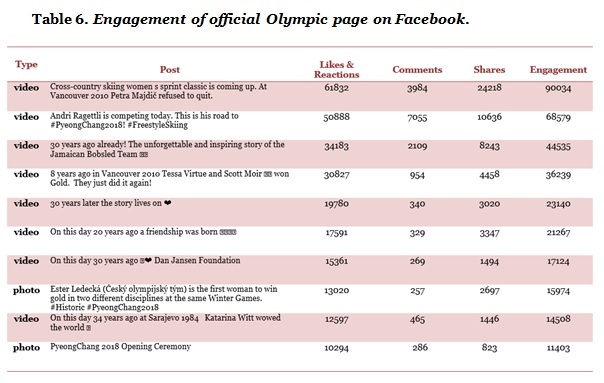 On Facebook we see more engagement with videos than with photos on the official Olympic fan page. 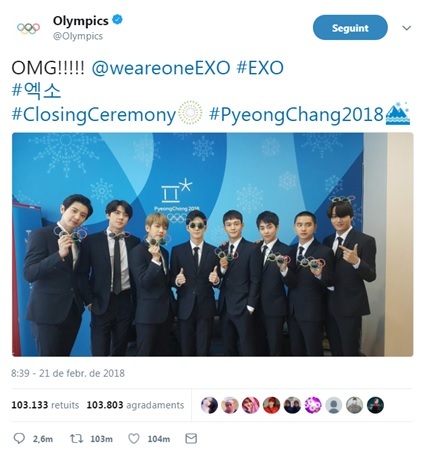 Olympics and olympiko were two of the top five most mentioned accounts on Twitter, and whereas the presence of immensely popular K-pop bands detracted attention from the Games themselves, Pyeongchang 2018 shall be considered nothing but a great success regarding internationalisation of the Winter Games and the Olympic movement on social media. Coakley, J. J. (2004). Sports in society: Issues and controversies (8th ed.). New York, ny: McGraw Hill. Games: Actors, Management and Participation. Sport and New Media. En: A. C.Billings y M. Hardin (Eds. ), Routledge Handbook of Sport and New Media (pp.153–164). London: Routledge. Huang, J., Thornton, K.M. & Efthimiadis, E.N. (2010) Conversational tagging in twitter. HT ’10. Kwak, H., Lee, C., Park, H. & Moon., S. (2010). What is Twitter, a social network or a news media?, WWW ’10.